3D printer maker Stratasys today released what it is calling its most sophisticated machine to date, able to build objects using 360K color shades and hard, soft, opaque, or transparent plastics. The new J750 3D printer is an industrial machine that will enable companies to create full prototypes without having to assemble various parts made from different materials in separate print jobs. A complete sneaker created on the L750 in one print job. "The sense of realism out of the gate with this printer is very important," said Josh Claman, Stratasys' chief business officer. The predecessor to the J750 was the Connex 3, a washing machine-sized 3D printer that had three nozzles from which it extruded thousands of different colors. The J750 has six nozzles, doubling the number of material combinations available to a manufacturer. "This is like a premium Connex 3. That's the way to think of it," Claman said. 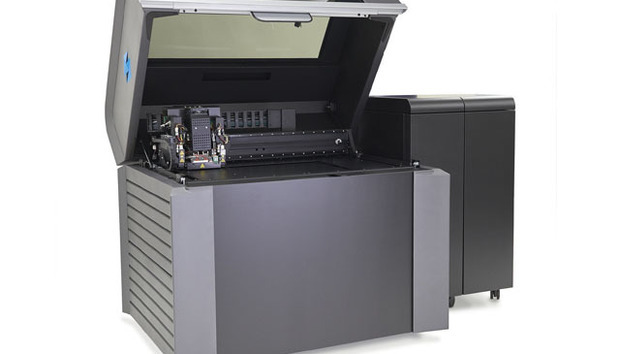 Like the Connex 3, the J750 is based on Stratasys' PolyJet 3D printing technology, which is similar to inkjet printing, but instead of jetting drops of ink onto paper, PolyJet 3D Printers jet layers of curable liquid photopolymer onto a build tray. Additionally, the J750 3D printer can use an updated version of Stratasys' PolyJet Studio slicer software. The software includes a new intuitive user interface enabling makers to choose materials, optimize the build and manage print queues from one screen. "When you think about the preparation of the .stl [stereolithography] file for print ... and think about post processing, artistic work, etc., a lot of those stages are made unecessary now," Claman said. The software also allows the use of any color, transparencies and rigidity. Color textures can be loaded fully intact via Virtual Reality Modeling Language (VRML) files imported from CAD tools. "We've used 3D printers for years but nothing has come close to revolutionizing our design and ideation process the way the Stratasys J750 has," Brycen Smith, engineering technician supervisor for smartphone cover maker OtterBox, said in a statement. This plate of faux sushi and chop sticks was printed in a single job with the J750 3D printer. Smith said the J750 that his company has been beta testing has allowed it to innovate in ways they never thought possible by allowing them to create "product-matching prototypes" and to cut down the time necessary to bring products to market. Claman would not reveal the price of the J750 printer, saying only it would be somewhere between that of the Connex 3 and the Object 1000, Stratasys' largest industrial 3D printer. The Connex 3 retails for around $250,000 and the Object 1000 goes for at least $750,000. With the ability to use multiple build materials and colors all through the same print head, the J750 can eliminate some of the complex processes required to create product-matching prototypes. For example, typically to create a product with hard, soft, clear and solid materials, each substrate of the model must be built separately. Stratasys' new 3D printer can create something as complex as a sneaker in a single printing. "We really believe the more we can simplify 3D printing, the larger the market for it becomes," Claman said.